Do you need to insulate your home? If you’ve talked to professionals, chances are you’ve heard of “fiberglass.” Fiberglass is one of the oldest insulation materials (it’s been used for centuries), and it’s still one of the most commonly installed types of insulation today. But many people don’t know how it works. How exactly does fiberglass insulation work? Fiberglass is a composite material made of a plastic matrix reinforced by tiny glass fibers. It is lightweight yet strong, and since glass isn’t a good conductor of heat, it’s a very effective insulation material. Fiberglass insulation stops conduction heat transfer—which is the transfer of heat through solid objects (such as the walls of your home). Fiberglass insulation can not only help you save on your energy bills, but it can also help make your home more comfortable all year long and improve the energy efficiency of your furnace and air conditioner. Our team uses insulation products from top manufacturers in the industry, including Johns Manville, Thermafiber and Therm-All. 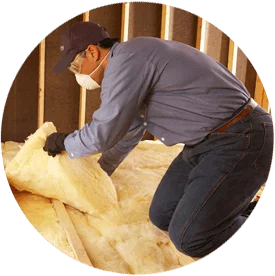 If you need to insulate your home in the Visalia, California area, we can help. Contact Broken Drum Insulation of Visalia today to learn more about our fiberglass insulation installation services!